Finally, for your viewing pleasure, a picture heavy post! I found myself home a little earlier than usual today. Since I did not win the much desired ticket to the Clinton/Obama debate on campus tonight (I have heard that 50,000 people signed up for the 100 tickets available in the drawing) I decided it would be best to get off campus early if at all possible. As I have a chunk of computer work that can be done at home I felt okay clearing out at 4:30pm. With the little sunlight remaining I decided to get some shots of my current WIP's. 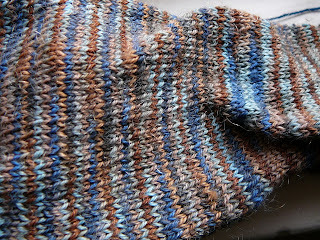 The closeup of the brown and blue colorway above is some fabulous Schaeffer Anne being knit up in my generic sock pattern for myself. I recently purchased a nice pair of Keen's at the REI clearance sale. They are the Keen version of the Mary Jane, so I have taken to wearing all my handknit socks with them. I can't wait to finish these! The pinkness here is a much better photo of the scarf I showed in my previous post. 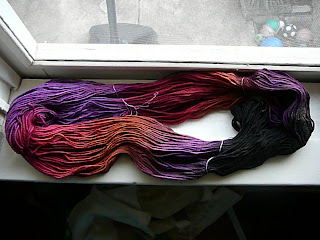 I have finished one out of two skeins, and I have a third for a crocheted trim edge that I've planned. Here you can see my male cat, Abraham, practically rolling his eyes at me for not having this sweater finished by now. I worked on this over the Christmas break and then just dropped it as soon as classes started. 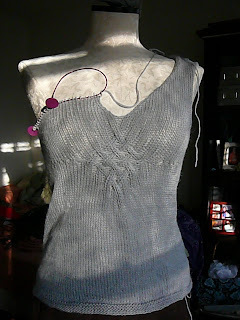 I've gotten the body knit up to splitting it for the front and back. As you can see below, one side of the front is completed and the other side started. The back stitches are still on holders. The yarn is some that our friend in Germany gave me when I visited with my dad the other year. It's a wool/alpaca blend. 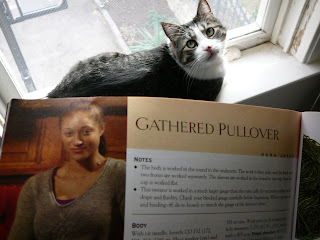 This pattern calls for the yarn to be knit on larger than usual needles in order to give the knitted fabric more drape. The openness of the stitches also means the alpaca shouldn't get to warm. Important in this central Texas climate. I did make one modification. 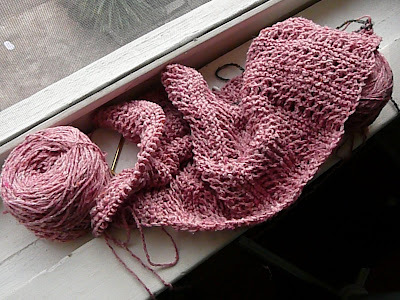 Since I don't like the rolled edge that results from starting with stockinette, I started with rows of garter stitch. I plan to do the same on the sleeves hems. I haven't decided yet how to deal with the neck opening, since I think the pattern has you pick up stitches and knit that rolled edge there as well. 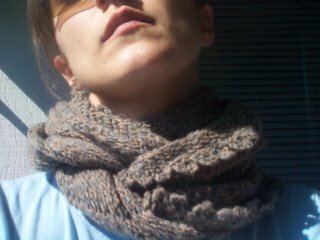 Perhaps a seed stitch? Here's a closeup of the center cablely motif. 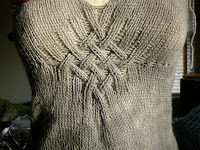 I quite like it, and I know it will be even nicer when the rest of the sweater is blocked. I also might go with shorter cap sleeves and wear this as a layer with a long sleeved white shirt. I might get more use out of it that way. While I do have some sock yarn in my stash at the moment, the percentage of it in comparison to other types/weights of yarn is actually pretty low. I have quite a lot more lace yarn, so I have put a purchase ban on any more until I use up at least half of what I already have. Sock yarn, however, I don't feel nearly so bad purchasing. There is always a sock on my needles. Of late I have branched out in my brands of sock yarn, much to my delight. 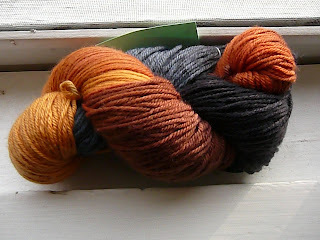 The yarn seen here is a recent purchase from The Loopy Ewe. Fiesta Boomerang in Jamaican Spice. This should be great to work with. It is so soft and sproingy! While the Jamaican Spice is for moi, this little number is for the request of another colleague. Natalie asked for a pair of socks. Specifically all wool. No nylon, no polyamide, just good old wool. I am happy to oblige with this Schaeffer Lola in the Walk in the Forest colorway. I think these will be the next pair I cast on. I hope you have enjoyed the yarny goodness!